A pair of researchers with ELTE Eötvös Loránd University in Hungary has run computer simulations that suggest that tales of Vikings using a sunstone to navigate in cloudy weather might be true. In their paper published in Royal Society Open Science, Dénes Száz and Gábor Horváth describe the factors that contributed to their simulations and what they found by running them. For the time period 900 to 1200 AD, Vikings, by nearly all accounts, ruled the northern Atlantic. Their skill in building strong boats and in navigation allowed them to travel throughout the North Atlantic. Prior research has suggested the Vikings used a type of sundial to navigate, which was apparently quite accurate. But what did they do when it was cloudy or foggy? Viking tales passed down through the generations claimed it was through the use of sunstones, which allowed Viking navigators to find the sun even on cloudy days. But proving the tales true has been problematic—no sunstone has ever been found on or near a Viking shipwreck. A crystal was found on a 16th-century English shipwreck in 2002—and English sailors could have learned to use them from the Vikings—but much stronger evidence is needed. Most who have studied the possibility of a sunstone assume it was a form of crystal—it has been noted that some crystals, such as those formed from calcite, cordierite, and tourmaline, can split sunlight into two beams even when it is cloudy—and when the crystal is turned, splitting the two beams at the same brightness, a navigator could see the polarized rings around the sun—effectively showing its placement in the sky. Száz and Horváth noted that thus far, no one has actually tested the use of such crystals to navigate from Norway to Iceland, Greenland, or even North America, likely because one or two excursions would not be enough to prove its usefulness, especially if it was not cloudy very often during such a journey. A better approach, they thought, would be computer simulations of multiple trips from one single point in Norway to one point in Greenland. After inputting data describing such trips, the researchers ran the simulations multiple times over the course of two specific virtual days, the spring equinox and the summer solstice. They ran the trials for different types of crystals and with differing intervals between sunstone tests. The researchers report that they found mixed results overall, depending on which type of crystal was used and how often a mariner made a sun reading. In the best-case scenario, however, they found that using a cordierite crystal for a minimum of every three hours was approximately 92.2 to 100 percent accurate. 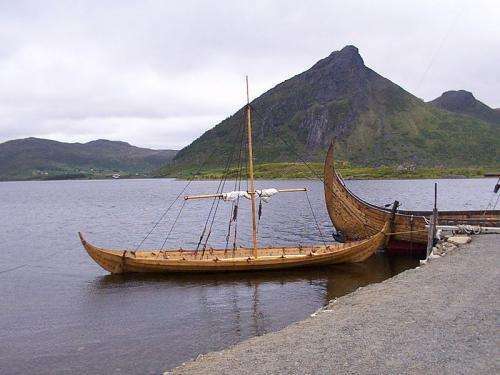 According to a famous hypothesis, Viking sailors could navigate along the latitude between Norway and Greenland by means of sky polarization in cloudy weather using a sun compass and sunstone crystals. Using data measured in earlier atmospheric optical and psychophysical experiments, here we determine the success rate of this sky-polarimetric Viking navigation. Simulating 1000 voyages between Norway and Greenland with varying cloudiness at summer solstice and spring equinox, we revealed the chance with which Viking sailors could reach Greenland under the varying weather conditions of a 3-week-long journey as a function of the navigation periodicity Δt if they analysed sky polarization with calcite, cordierite or tourmaline sunstones. Examples of voyage routes are also presented. Our results show that the sky-polarimetric navigation is surprisingly successful on both days of the spring equinox and summer solstice even under cloudy conditions if the navigator determined the north direction periodically at least once in every 3 h, independently of the type of sunstone used for the analysis of sky polarization. This explains why the Vikings could rule the Atlantic Ocean for 300 years and could reach North America without a magnetic compass. Our findings suggest that it is not only the navigation periodicity in itself that is important for higher navigation success rates, but also the distribution of times when the navigation procedure carried out is as symmetrical as possible with respect to the time point of real noon. An American named Marvin Creamer famously circumnavigated the world without instruments of any kind. Polynesians colonized the Pacific without instruments. The Vikings, like all seafarers in the northern hemisphere, could determine their latitude by measuring the Pole Star's angular distance above the horizon: any season, all night long. No need to wait for singularities, like a solstice or equinox. The sun, unlike the Pole Star, changes declination and azimuth daily. Latitude can only be determined at local noon, with instruments that are not practical to use at sea. So what did the sunstone do for the Vikings, cloudy or not? Knowing where the sun was on a cloudy day, even at local noon, would not be enough to deduce an accurate latitude. Latitude can only be determined at local noon, with instruments that are not practical to use at sea. They had a floating sundial disc that was used to tell local time. You plop it in a bucket and it stays upright. Before you set sail, you observe how tall the shadows get in your sundial and use that as a reference point. Then at sea, you keep watch whether the noon shadow is shorter or taller than what you had at home, and you know whether you've drifted off your intended latitude. When it's cloudy and you don't have a shadow, you just try your best to keep your heading by using the sunstone, because you still know approximately what time it is from how high the sun is, and even if you didn't, keeping the sun at a fixed angle to your boat will keep you heading the same way on average. Can't see the pole star during the day, so you have to tell direction by the sun. The reason to sail at the equinox is because the day and night are equal time, so the sun rises directly from the east and sets exactly in the west - helps a great deal. On the summer solstice in the north, the day is almost 24 hours long and the sun just barely dips down in the north - again a very useful clue as to where you're going, and also safer because there's no "moonstone" to see the Pole Star through clouds. The longer you have daylight, the safer. You don't want to sail in the autumn because you'll get stuck over there for the winter without knowing whether you have anything to eat or live by, and you don't want to sail in the winter because it's freezing cold and the weather is bad. Hence, most of the sailing was done in early spring, summer, and the return trip was scheduled for late summer. But for contemporary generation of nerds experienced with computers but separated from reality is way more comfortable to make simulations ad nauseam rather than really test something experimentally. The power of computer simulations is that you can make monte carlo simulations, where you introduce random errors in the navigator's efforts and run thousands and thousands of variations of the trip to see where it would end up. If the navigation method is accurate enough, the probability of ending up in the right place is maintained despite the small errors. If not, the errors compound and most of the ships get lost. Making the real experiment would result only in anecdotal evidence, as one trip across the ocean can't tell whether you got there by skill or by luck, and making hundreds of voyages would be infeasible, and also irrelevant as the navigators would be complete amateurs compared to their Viking counterparts who did much more than just gaze at the sun. The point of the simulation was to first perform the field experiments to find the limits and range of accuracy to expect out of a sunstone as a navigation system, and then plug these limits into the virtual model to constrain the virtual navigator, and then find out whether that level of accuracy would be enough to reach the destination. Here the "accidentally" part of discovery was eliminated by randomizing enough journeys so what would have been found by accident became inevitable. A real expedition would not have been able to measure the effect of periodicity/symmetry if they were following viking habits, since they wouldn't have had a clock on the boat. The thing is: a sunstone works even in cloudy weather. Looking at the Pole star doesn't.